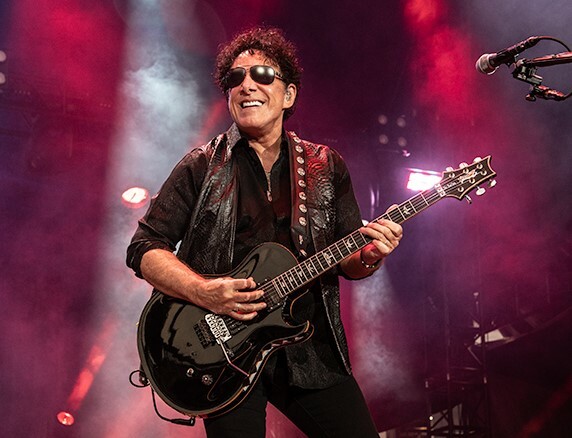 Journey guitarist Neal Schon never met Prince. But he heard from reliable sources that the Purple One liked him. Maybe Prince discovered Schon the teenage guitar prodigy in Santana. Or maybe Prince heard Schon in Journey. Whatever, Schon got word about Prince’s admiration from Brian Ach, a photographer whom Prince hired to chronicle his 2011 tour. Schon told the Star Tribune: “Brian asked him ‘Who are your three favorite guitar players?’ Prince told him first was [Bruce] Springsteen ‘cause he loved that he was stout and strong in his rhythm playing and how he conducted his band. He said John Mayer second, not for his pop but for his blues stuff. I couldn’t agree more. And he said Neal Schon. Schon, who will perform with Journey Friday at Target Field, added that he heard about the six CDs that Prince purchased at the Electric Fetus a few days before he died in 2016. One of the albums was the week-old “Santana IV,” featuring Schon on guitar and the rest of the lineup that had made “Santana III” in 1971.